Once only a dream to the eco-conscious Canadian, green roofs have become an established trend in urban living. Appearing from coast to coast, green roof developments are not only aesthetically pleasing, but offer environmental, economic, and social benefits as well. As contained ecosystems, green roofs help offset city stresses, including the urban heat island effect, storm water management, water purification, improved air-quality, increased biodiversity, and the opportunity for urban agriculture. They also offer financial benefits through the reduction of energy and noise, providing a value-added and desirable amenity space, as well as local jobs and educational opportunities. Easing social, environmental and economic pressures, green roofs provide a comprehensive solution to our urbanized manmade spaces. Recently, the conceptual masterplan for The Silvertree residential development in Vancouver, BC was approved. What's particularly remarkable is how the plan incorporates a continuous green roof system as the hub for the proposed development. Designed in collaboration by the environmentally-concious architecture and planning firm B+H Architects, as well as recently established W Architecture firm, the sustainable housing development boasts a way to redefine the industrial landscape of the Fraser River. The province of British Columbia is well known as an environmental steward, and due to the project’s location it will be one of the first sights to be seen upon entering Vancouver. 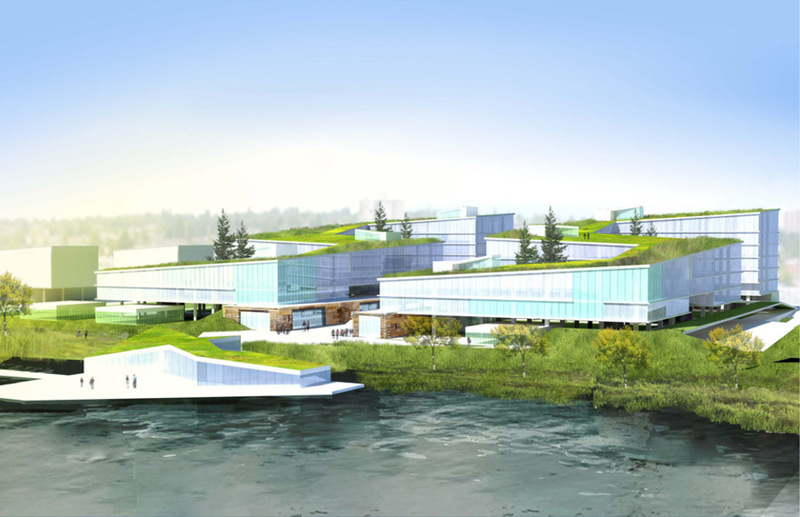 This proposed 'sea of green' atop The Silvertree building will provide a defining impression for the City of Vancouver. The proposed residential building will include a retail plaza, lowering the reliance on vehicle transportation for shopping needs. As well, seeing as Vancouver has a temperate climate, the roof will remain a usable outdoor green space throughout the year. Vancouver isn’t the only city to have green-roof developments. With new and improved Green Roof By-Laws recently introduced, Toronto will also see more green-roof installations. As environmentally responsible green roofs become more common, the sustainable, social and economic benefits will improve our Canadian urban landscapes. These are exciting times for green living in Canada. Want to learn more about green roofs in Canada? Check out Houseporn's past article called The Green Roof Take's Higher Ground, or the Canadian Green Roof's for Healthy Cities organization.